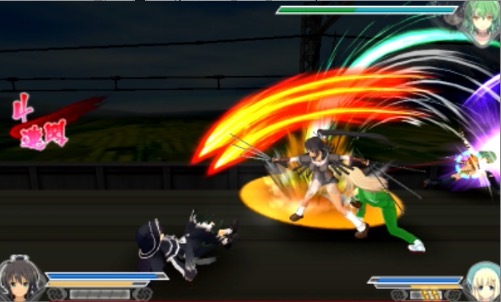 The Senran Kagura franchise may have made the leap from 3DS over to Sony consoles and mobile devices, however the latest game to hit the states is a direct sequel to the “Crimson Girls” segment of Senran Kagura Burst on the 3DS. Borrowing elements from its Sony console counterparts, Senran Kagura 2: Deep Crimson vastly improves on its predecessor, with new environments, tag-team gameplay mechanics and other features. Senran Kagura 2: Deep Crimson kicks off with the finale of the Crimson Girls plot from Senran Kagura Burst. The girls of the Hebijo Clandestine Girl’s Academy for evil shinobi were forced to turn on the school after its investor Dogen summoned “Orochi”. A giant “Yoma” demon concieved from the blood of Hebijo students and parts of the school itself, Dogen attempted to use Orochi as a weapon to conquer the world. After settling their differences, Homura and Hanzo Academy student Asuka defeated Orochi and put an end to Dogen’s plot. Their victory came at a price; by fighting Dogen and the Orochi, Homura and the elite students of Hebijo were forced into hiding, becoming renegades hunted by their former school. Now under the title of “Homura’s Crimson Squad”, the group of former Hebijo elites are dragged out of hiding upon learning that Dogen has returned with an army of Yoma created with the blood of Hebijo and Hanzo students; his army of demons possess both the likenesses and strength of the elite shinobi from both schools. Meanwhile, the elite students of the Hanzo Academy are wrestling with the ethics of their current mission, and what it means to walk the path of a “good” shinobi. Their mission eventually overlaps with the Crimson Squad’s quest to erase the Yoma from Japan; only then do they discover Dogen’s true, extremely elaborate intentions. By summoning an exponential amount of Yoma into Japan, Dogen hopes to disturb the spirit of Kagura, an ancient reincarnated deity with overwhelming power. If enough Yoma are present, Kagura will reach her true potential and wipe the entirety of the demonic presence from Earth- Dogen hopes to capture Kagura and extract her power to become a supreme being. Homura’s Crimson Squad and the Hanzo Academy students reluctantly pair up in hopes of stopping the Yoma threat before Kagura’s true awakening. Those who played Senran Kagura Burst will immediately find that the plot is intertwined between Hanzo Academy and Homura’s Crimson Squad; depending on the mission, players will jump back and forth between characters on both sides. Like its predecessor, Senran Kagura 2 conveys most of the plot in a visual novel format, with dialogue from the perspective of certain characters- primarily Homura, Asuka, Master Kirya of the Hanzo Academy, and Hanzo himself. For those who may have found the story presentation of the first game rather bland, Deep Crimson includes both conversational and action cutscenes, both of which are presented in stereoscopic 3D. All of Deep Crimson‘s gameplay modes are organized within a central hub; the overworld, characters and clothing change as the story progresses. Whether it’s the hidden cave of Homura’s Crimson Squad or the lounge of a Japanese bathhouse, players can access the main Story chapters, several varying challenge modes, or interact and switch between other characters. The five elite members of each faction are available from the start, with more characters becoming available as the player progresses through the Story Mode. Those who have a 3DS with Senran Kagura Burst data saved directly to the SD Card will have access to an extra third character; he can alternatively be purchased as DLC. The “Mission” menu contains all of the Story chapters, several “Training” mode tiers, and stages designed specifically for co-op play. Adventurous players looking for a challenge can also dive into the “Yoma’s Nest” gauntlet. The Yoma’s Nest is a continuous wave of stages where the character’s overall status is carried over between each level; health is not recovered between stages, however this is one of the best methods for raising the experience level of each character. “Special Missions” can only be completed by fulfilling a certain criteria; these range from completing the mission with strictly air-attacks, to breaking objects within a set time limit. Upon completion, the player is awarded a Shinobi Stone. Each character can equip up to three Shinobi Stones, which modify the properties of attacks, defensive capabilities or movement. An extreme amount of customization items are unlocked by completing Story missions, or reaching certain tiers of the Yoma’s Nest. Over 100 cosmetic items between costumes and accessories can be unlocked, along with several alternative weapons for each character. While Senran Kagura 2: Deep Crimson is a side-scrolling beat-em-up at its core, the sequel is now in full 3D, with larger stages and several new gameplay features. Despite the new level of exploration in terms of finding hidden power-ups or health items, each stage remains fairly linear, apart from the occasional boss arena. Some levels are still a side-scrolling corridor, however there’s always a strategically placed tower level, time-trial, or boss arena to break the monotony of the more linear stages. With the ability to freely roam around in each stage, Deep Crimson adds a lock-on feature allowing players to dash into a particular enemy and perform a combo attack. With a few exceptions, each character has a combination of light and heavy strikes, some of which can launch enemies into the air for a continued “Aerial Rave” air combo; Mirai is one particular exception, as her “Heavy” attack switches her current weapon between an umbrella, grenade launcher and a minigun. Both the X and Y-Buttons can be held for even stronger attacks, some of which can reflect projectiles back at opponents. As with the previous titles, the player fills a special attack gauge through combos or by obtaining scrolls found in each level. Once the first level of the gauge is full, the character can then transform into their Shinobi form; this enables faster movement, longer combo strings, a higher damage output and the ability to perform special attacks. Depending on the special gauge level, the player can perform various types of Ninja Arts special attacks; X-Button Ninja Arts require one stock of the gauge, while Y-Button specials require two. Ninja Arts vary between characters, but each technique is generally used for maximum damage, or “crowd control” with a wide range of effect. Once a character transforms into his or her Shinobi form, he or she can enter the “Frantic” state for an extra damage boost, and the ability to perform unlimited Ninja Arts. Enabling the Frantic mode comes at a strategic risk, as the character’s health is slowly depleted, and their defensive capabilities are drastically lowered, as depicted by the shedding of their clothes. Apart from the Frantic state, characters will also lose their clothes over the course of battle; this is purely a cosmetic feature, as it has no effect on the character’s overall defensive stats. Deep Crimson also introduces a new tag-team system, allowing players to create an active pair of any two playable characters in the game. Each character operates the same way, however the character not in-play will attack other enemies at will. By holding the A-Button, the tag-character will attack whichever enemy the player is currently engaging; tapping the A-Button will switch tag-team members, or perform an assisted air-combo if the player is in the middle of an attack. 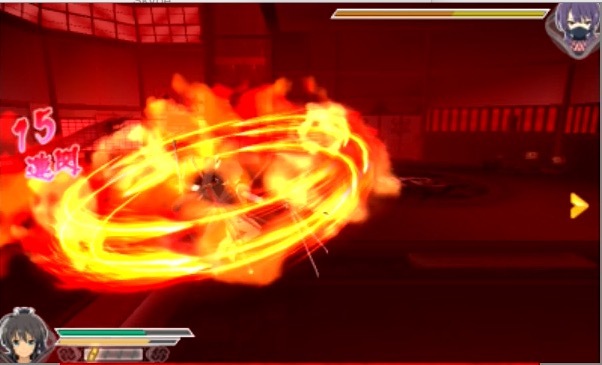 If both tag-team characters have a special gauge stock of three or higher, the player can activate a “Secret Fusion Ninja Art” with both characters. Not only is this the most powerful technique in the game, but every possible pairing of characters will have their own unique Fusion Ninja Art attack. 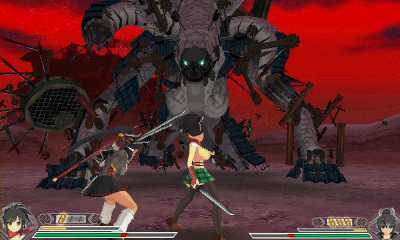 Senran Kagura Burst was lacking variety in its boss fights; most of the boss encounters were against students of the Hanzo and Hebijo Clandestine schools. Senran Kagura 2 puts the player up against not just the elite students of both factions, but an army of powerful Yoma Generals, and screen-filling creatures. Some of the basic boss fights involve a standard fight in a 2.5D level, while others are fast-paced free-roaming arena fights; one of the larger bosses towards the end of the game involves evading its appendages and climbing up a structure to attack its main body. In the midst of the chaotic action, Deep Crimson‘s glaring issue rears its ugly head- the camera control. 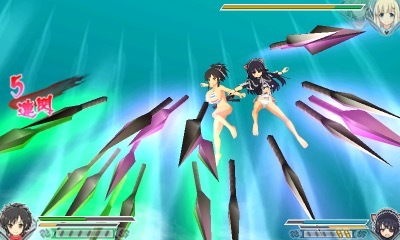 A player-controlled camera wasn’t an issue with Senran Kagura Burst, granted that each stage was a 2D side-scroller. With the transition to 3D- even though many stages are still side-scrollers- some enemy attacks cannot be seen until it’s too late. 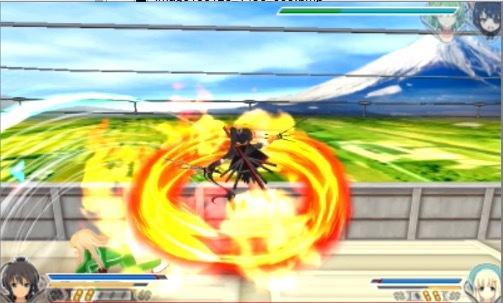 Even with the new lock-on ability, the camera tends to not shift to show locked-on enemies that are off-screen; the player may occasionally teleport off-screen when performing an air-combo. Senran Kagura 2 isn’t a full 3D brawler like its Sony console counterparts, but the lack of camera control can result in some frustrating enemy encounters. The title does include support for the Circle Pad Pro peripheral, however this only appears to control the camera in the “Dressing Room” and other menu interfaces. Along with the drastic visual change, the musical quality of Senran Kagura 2 is a stark improvement over Burst. Gone are the looping tracks of its predecessor, as Deep Crimson uses full-length selections for each level; more than 40 unique tracks are featured over the course of the game, ranging from intense rock to J-Pop, and the occasional orchestral piece. For an added bonue, anyone who pre-ordered a physical copy of Deep Crimson was also given a physical copy of the game’s soundtrack. The 3DS library is admittedly lacking in frantic action titles, but fortunately Deep Crimson is here to deliver. With the chaotic nature of its gameplay and a plethora of new modes and features, it’s sure to please anyone looking for a competent action game on Nintendo’s handheld. The lack of camera control may lead to some jarring moments, but it’s overshadowed by the sheer amount of content that the game has to offer; from extra missions to character customization, Deep Crimson will keep players busy for quite some time. Senran Kagura 2: Deep Crimson is a surprisingly fun experience, not to be overlooked by action-lovers and franchise fans alike.